Is registration of model aircraft a thing of the past? The Federal Appeals Court of the District of Columbia ruled today that the FAA rule requiring that model aircraft be registered was in violation of the section 336 of the FAA Modernization and Reform Act of 2012. In what was called a David vs. Goliath case, John A. Taylor brought the case against the FAA earlier this year. The court stated the following in their ruling. In short, the 2012 FAA Modernization and Reform Act provides that the FAA “may not promulgate any rule or regulation regarding a model aircraft,” yet the FAA’s 2015 Registration Rule is a “rule or regulation regarding a model aircraft.” Statutory interpretation does not get much simpler. The Registration Rule is unlawful as applied to model aircraft. There is the option for the FAA to appeal the decision but it is unlikely to be heard by a higher court anytime soon. The only other option is for the FAA to lobby congress to repeal or amend the 2012 law. This is a huge win for hobbyists and will ease the access to model aviation once again. The registration rule had minimal impact on the safety of the national airspace and was seen as a government intrusion by most. We will continue to watch the progress of cases such as this one and pass the information on to you. Today we congratulate John A. Taylor on helping maintain our abilities to enjoy this great hobby without extra burden. 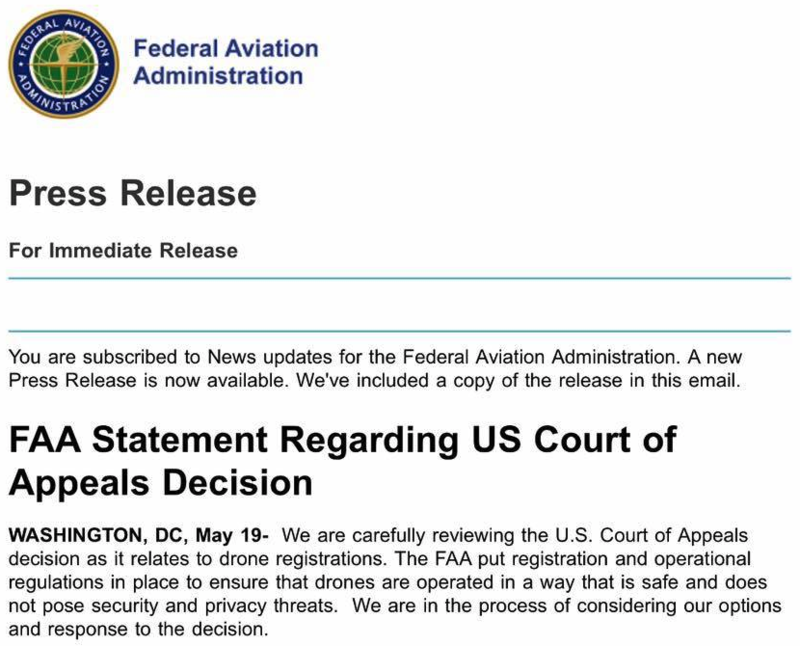 The FAA has posted a response to the ruling. They are reviewing their options at this time.